Clear, concise, and personalized SEO reports for your clients! DashThis’ sample SEO reports helps you create beautiful reports for your client's site that include all your most important SEO data. Whether you work on link building, organic search, or landing pages, DashThis simplifies your SEO reporting with monthly SEO report templates. Combine all your marketing tools into one streamlined report, and schedule an automated email dispatch to ensure that your clients get their reports every month. See this SEO report sample live! DashThis gives you simplicity with our pre-built SEO report templates, the speed of an automated tool, with the customization power your agency needs. Track all the data from your client's website, their search traffic, backlink profile, search volume, conversion rate, clickthrough rate, best performing keywords, every search engine optimization data you need! Explore our SEO reporting software! Choose from among our pre-built KPIs, or create your own with a variety of chart types, metrics, dimensions, segments, and filters. 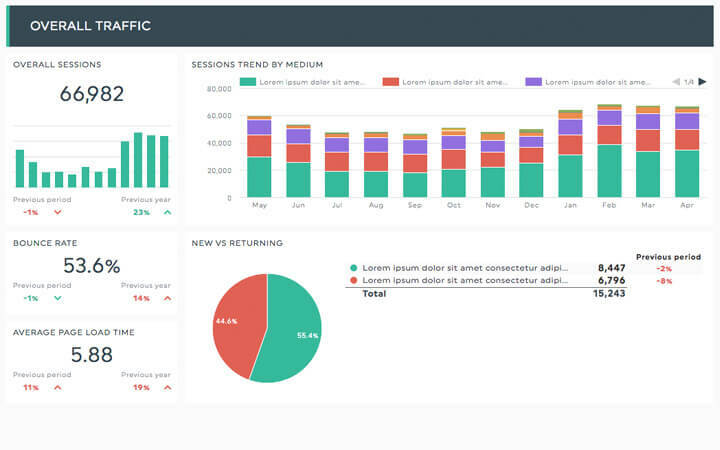 Drag and drop these KPIs in your report to create the layout you want! Any of our sample SEO report templates can be entirely customized to fit your brand. Add your own logo, incorporate comments and notes, or go totally white label with a custom URL, custom design, or both! Share your SEO report with your clients quickly and easily! You can either schedule an automated email dispatch, share your report’s dedicated URL, or print out your SEO report sample PDF! You can connect a ton of SEO marketing tools into our SEO report sample: Google Analytics, Ahrefs, SEMRush, Moz, Google Search Console, WebCEO, and more! Start with our sample SEO report, connect your own data, and customize your report just the way you want! It’s as easy as 1-2-3! Include your Google Analytics data, Google Search Console data, and a lot more… all in the same report! Choose from among our sample SEO reports in the drop-down menu, and you’re all set! Choose from among our SEO report templates, swap out KPIs, add different integrations… there’s no end to the type of SEO report you can create for your client! With Google Analytics and Google Search Console both in the same report, it’s easy to track your organic traffic performance. Keep tabs on your competitors’ backlinks, how many you’ve got, the domain name, the domain and page authority, etc. See how your keywords rank and perform on various search engines, and how their positions evolve over time. With our SEMrush SEO report sample, you can track your keyword rankings and SERP positions, and identify your opportunities. Monitor your client website’s SEO with a Moz report and get a precise view of what’s working and what needs improving. Keep track of how your competitors' search results, how they are ranking on search engines, and adjust your strategy accordingly, with our Ahrefs SEO report sample.